Some users have noticed that certain older iPhone and iPad models feel slower after updating to iOS 7. We’ve offered a variety of tips to speed things up, but one persistent issue that has we’ve been contacted about regards the mysterious keyboard lag and typing delay that seems to only apply to older devices, where there is a sizable delay between tapping a key and the character appearing on screen. The iOS device will reboot and show a progress bar indicator as all settings on the device are trashed and reset to defaults. When finished, the device will boot up as normal again. This dumps all customizations and settings to iOS, meaning you’ll need to do things like bold the font, set your wallpaper, rejoin wi-fi networks, and make other usability adjustments again, but it does have a noticeable impact on the keyboard lag issue that has impacted some users, at least on an iPhone 4, 4S, and iPad 3. 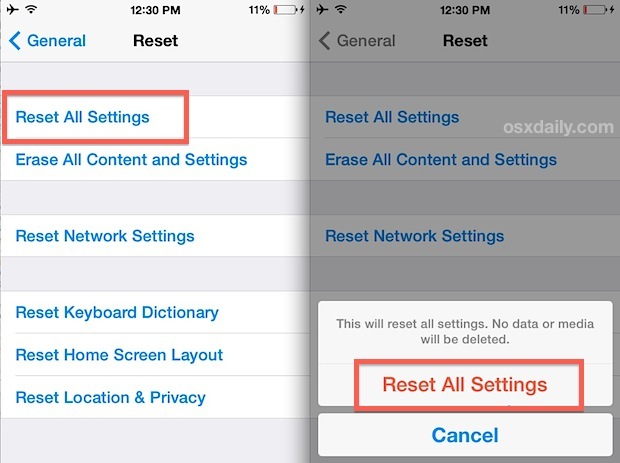 Resetting all settings applies exclusively to settings and does not delete any data from your device and is not to be confuse with the completely separate procedure of a full device reset to factory settings, the latter of which removes everything as if it was a brand new piece of hardware. There may be a relationship to the lag and the autocorrect dictionary, and some users have reported success with resetting the auto-correction dictionary list. In our tests that did not work reliably enough to recommend it though, and instead the best trick we’ve found so far involves a universal settings reset. It is quite likely an upcoming iOS software update will resolve this issue completely, but in the meantime try out the settings reset, it can help. I’m still using the old operating system 6 on a 4S and was also experiencing lags in my typing in Gmail all of a sudden. I shutdown and restarted my phone and that seemed to improve the situation. I typed this message in my Gmail and did not encounter any problems or lags. To reiterate, I have not updated to the new iOS 7 operating system but was experiencing the same lagging keyboard issue and constantly seeing the “network activity” spinning icon upper right on the status bar.